Once again, Chick-fil-A rides to the rescue. There was a massive power outage and cancellations yesterday at Atlanta’s Hartsfield-Jackson airport. 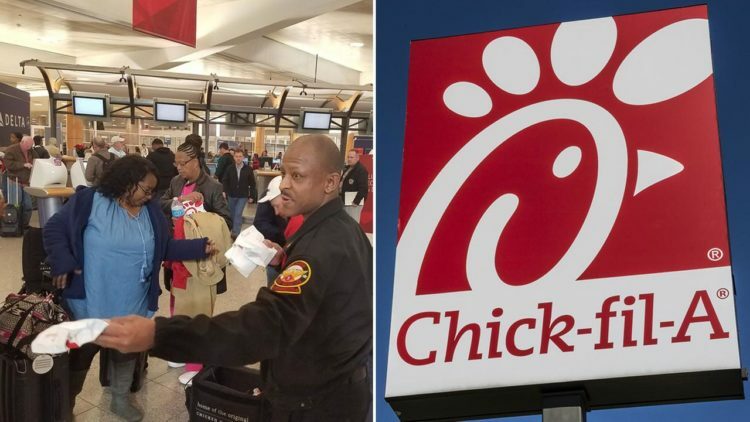 Chick-fil-A is normally closed on Sunday, but they called their employees and took food to the airport. This is the busiest airport in the world. They gave out yummy food to stranded travelers both in and outside the airport. Mayor Kasim Reed thanked Chick-fil-A for helping people the way they did. They confirmed that over 2,000 meals were handed out to hungry travelers as of 11:30 pm last night. People were very thankful for the food and people took to twitter to praise Chick-fil-A. They weren’t the only ones helping. Dunkin’ Donuts also gave away doughnuts to stranded passengers at the Hartsfield-Jackson airport. Typically, you can’t eat at Chick-fil-A on Sunday. Truett Cathy, the company’s founder and father of CEO Dan Cathy, made the decision so “he and his employees could set aside one day to rest and worship if they so choose.” But exceptions are made in times of need. It’s the Christian thing to do. This custom is not without its drawbacks. When Chick-fil-A announced in August that they would be opening a outlet at the Atlanta Falcons’ new Mercedes-Benz Stadium, they insisted that they would not be open on Sundays — which is when the Falcons play most of their games. It’s the principle of the thing. The power was restored to the airport at about 12 am this morning. Vendors started opening shortly after the lights came back on. The power outage was caused by an electrical fire that started in an underground facility and eventually brought down the backup power system, as well. It caused massive chaos. Thank goodness Chick-fil-A was there to help. It made the whole insane scene a bit easier to endure. I propose that Chick-Fil-A and Southwest team up and hold a conference to teach all other companies how to do customer service. They're the only ones who've figured it out. This is why we love our @ChickfilA and God continues to bless them. They are a servant and good steward to their patrons. Shout out to @ChickfilA for providing free food for those stranded at the #ATLAirport. And they are closed on Sundays. Always clutch like Kyrie! ??? ?